Whats more inviting than a beautiful custom door. This door and side lights are a perfect entry for this english style farmhouse. Could you tell me that stain color please? Hello, this is a mahogany species custom door with a clear coat finish. Thanks for your inquiry. Aleece Davis, Arbor Hill Interiors Co.
Front Door. - Hi Aleece We are also in PA......would you be able to give me an idea of how much this door costs and where are you located? Thanks! Arbor Hill Interiors provided a diagram to Old World Doors who then made the door after our selection of the wood species and finish. There is a Dutch door on the side of this same house that you can see in our other photos from this project. We used this company to create that door as well. Thank you for your interest. Thanks for your inquiry. We are not able to retrieve that info from our files but I believe this was a clear glass. What are the dimensions of this door? Primarily the thickness? Thank you for your inquiry. This custom door is 2 and 1/8" thick. Aleece Davis, Arbor Hill Interiors Co. Thanks for asking! This was a project in a suburb of Philadelphia where we used a local source for flagstone. You may have also heard of Pennsylvania 'bluestone' which is similar. Bluestone is very consistently a blue grey tone. We prefer flagstone for its more interesting mix of color. 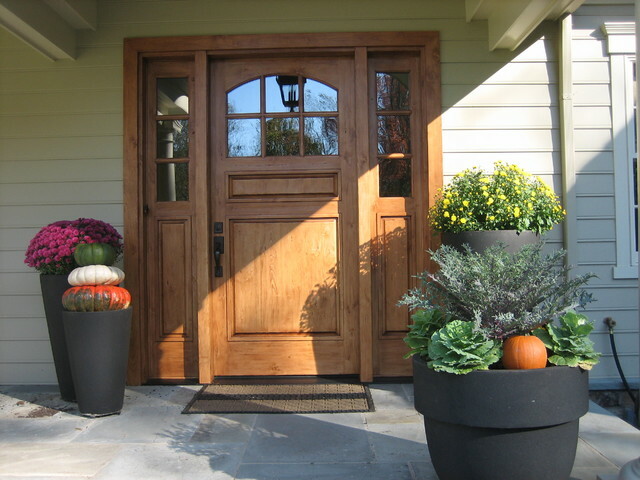 Aleece Davis, Arbor Hill Interiors Co.
what are the names of the plants in the front pots with the pumpkin? These are cabbage plants, with a kale plant in the center. Flower pots - I love the black pots. Where can I purchase these? Thank you for your inquiry. These pots are from Campana Intl. What wood species is this door?